Tom Schmidt | John Ash & Co.
One of Wine Country’s best known restaurants, John Ash and Co. remains an icon for gourmet, wine country dining with Executive Chef Thomas Schmidt continuing the standards of cooking excellence enjoyed by locals and guests alike. Chef Tom Schmidt brings a wealth of knowledge and creativity to Sonoma County’s wine country. Although Tom is an expert in formal culinary methods, his skill is not driven by technique alone. Rather, it involves an intuitive understanding of complementary flavors, textures and colors combined with the knowledge of using seasonal foods at their freshest. Tom attended Contra Costa College, studying culinary arts under the instruction of Chef Kenneth Wolff and working as a sous chef for three years, honing his skills in all aspects of kitchen operations and prep work. 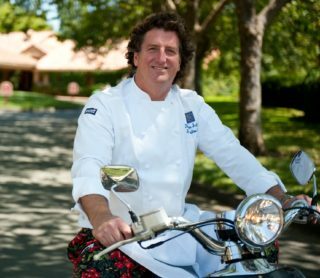 As an executive chef in Woodside, California and later as owner of a catering company, he learned that working with the freshest ingredients and letting their flavors speak for themselves is the most important aspect of cooking. Tom’s passion for fine cuisine took him to Europe, where he opened the highly-regarded restaurant, Topaz, in Bremen, Germany, famous for its small plates of German, French, and Italian cuisines. Years of experience and endeavors have led him to our team here in Sonoma County.